“Sound Scene,” Washington, D.C.’s annual auditory “happening,” is coming to the Hirshhorn. For the third year in a row, local sound collective DC Listening Lounge will take over the entire museum with radically interactive audio art installations. 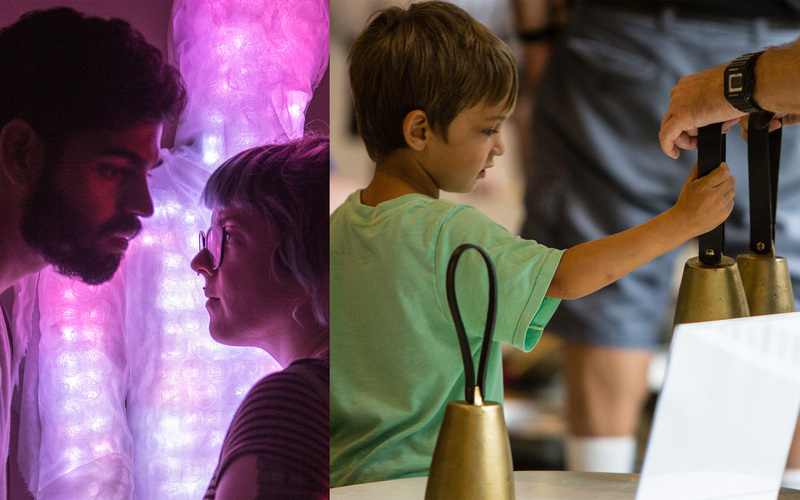 From Saturday, July 7, to Sunday, July 8, 10 a.m.–5 p.m., the galleries and plaza will become sonic destinations for performances, games and workshops, free and open to all ages. Advance online registration is recommended. Sound enthusiasts can also enjoy live performances from artists Layne Garrett, Sam McCormally, Julie Moon, David Schulman, Heather Spence, members of the National Symphony Orchestra, Smithsonian Folklife Festival visiting artists and the modern dance ensemble Errant Movement. The event is part of the Hirshhorn’s diverse range of free public programs, which invite today’s leading innovators in art, design, music and technology to explore ideas that shape 21st-century culture. ASL interpreters will be available for select performances and workshops. DC Listening Lounge is an audio collective of sound enthusiasts that meets monthly in Washington to listen together, workshop audio and nurture an ongoing conversation about sound, art and everything between and around the edges. “Sound Scene” has been held annually at different locations around the city since 2008. Visit dclisteninglounge.org to join.